Since the Navy owns Nick now, he was not able to accompany me to Massachusetts for my week long vacation. He did, however, get to come up for about 28 hours to make it to our friends’ wedding. In the 28 hours that we were both out of our house, tragedy struck. I got back late from the airport, after a stressful day of travel complete with a 4 terminal sprint through Atlanta airport and a few tears shed to the woman at my connecting gate who was not happy about re-opening the door for me. All I really wanted to do was plop down on the couch, relax, and catch up on my DVR. That’d be too much to ask, though. I walked into the house to find a pool of water in my kitchen. A bad feeling struck, and as I opened the freezer door to see water where my ice cubes should be, my heart sunk. I’m pretty sure anyone would be upset about losing the contents of their fridge & freezer. It’s not cheap to replace everything. But for me, it was a tragedy. Our freezer contained pounds of priceless meat. Halibut and moose and venison sausages from family in California. Ahi tuna and grouper and giant sea scallops from our last trip to Pensacola. Grass-fed steaks that Nick’s Dad had just sent us less than a week before. Crappie and bass Nick caught a couple months ago before the heat wave when fishing was bearable. Leftover crawfish tails from our big boil. Not to mention a bunch of regular ole supermarket chicken and the rest of our groceries. Tragedy. Well, luckily, it turned out that everything was still cool. Completely defrosted, but at least still cool. I rushed everything to my neighbor’s freezer, hoping that I wasn’t about to poison myself and Nick with rotten food. I went back and forth trying to decide if I should throw it all out, but in the end I figured if hadn’t gotten warm, it probably wouldn’t kill me. In case you were curious, so far we’ve eaten steaks, chicken, halibut and crawfish from the freezer… and no one has died or even gotten sick! Hooray. Though I sort of saved the meat, defrosting and refreezing doesn’t do a lot for it’s quality. I thought turning some of the fish into burgers might give it new life. And I was right… it was delicious! Cut the halibut into smaller chunks and place it into a food processor. Pulse until the fish is ground. Meanwhile, to prepare the salsa, toss all ingredients together in a bowl. To make the cream, mix all the ingredients thoroughly. 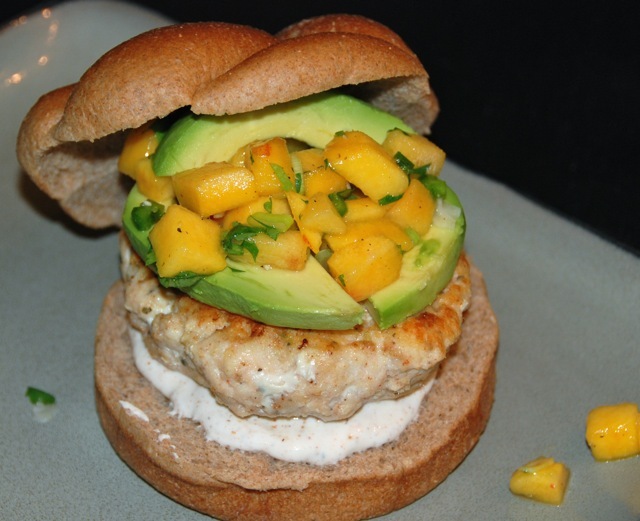 Serve the burgers on whole wheat buns with sliced avocado, chipotle cream and peach salsa. The burgers were awesome! 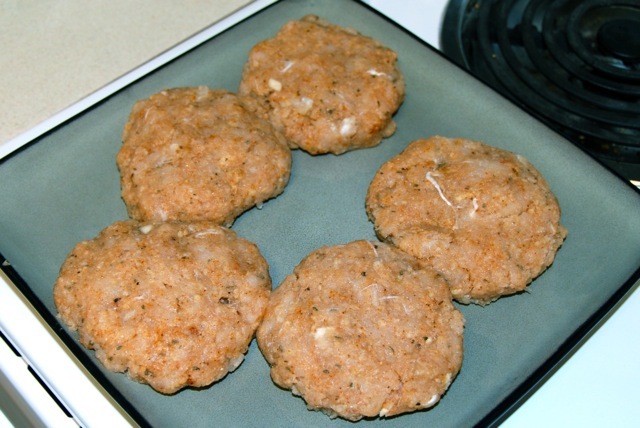 I was afraid they might dry out, but they were perfectly moist and super flavorful. The smoky cream and sweet salsa were the perfect complements. 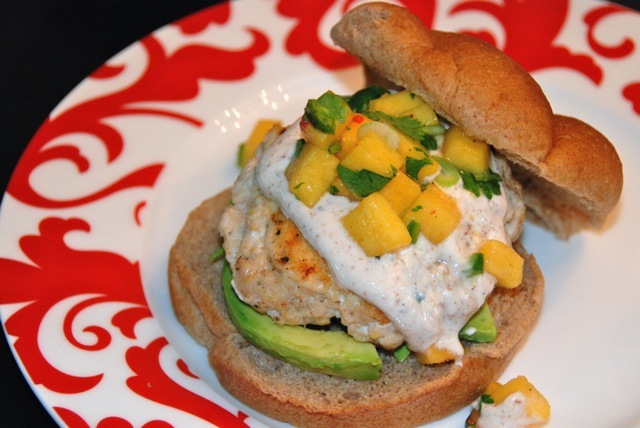 I would definitely make fish burgers again, and maybe try out some new flavor combos! 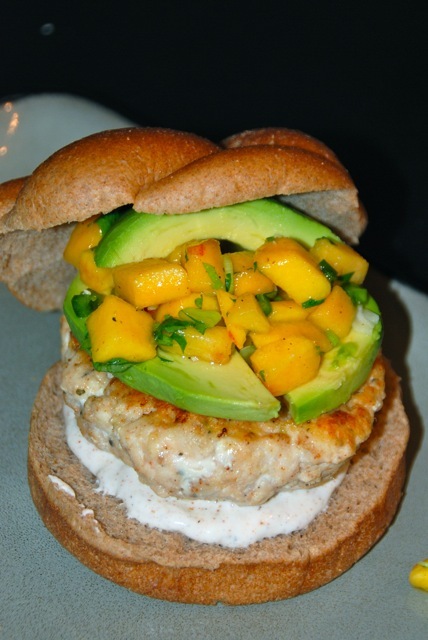 I love the idea of a fish burger outside the standard salmon. Such a great idea, and even better with the toppings!